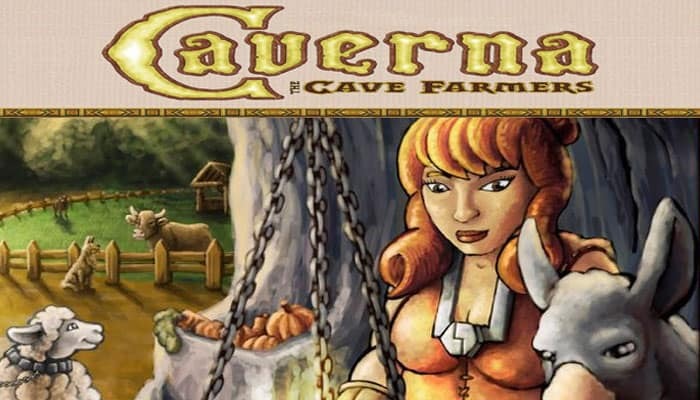 Following along the same lines as its predecessor (Agricola), Caverna: The Cave Farmers is a worker-placement game at heart, with a focus on farming. In the game, you are the bearded leader of a small dwarf family that lives in a little cave in the mountains. You begin the game with a farmer and his spouse, and each member of the farming family represents an action that the player can take each turn. Together, you cultivate the forest in front of your cave and dig deeper into the mountain. You furnish the caves as dwellings for your offspring as well as working spaces for small enterprises. It's up to you how much ore you want to mine. You will need it to forge weapons that allow you to go on expeditions to gain bonus items and actions. While digging through the mountain, you may come across water sources and find ore and ruby mines that help you increase your wealth. Right in front of your cave, you can increase your wealth even further with agriculture: You can cut down the forest to sow fields and fence in pastures to hold your animals. You can also expand your family while running your ever-growing farm. In the end, the player with the most efficiently developed home board wins. 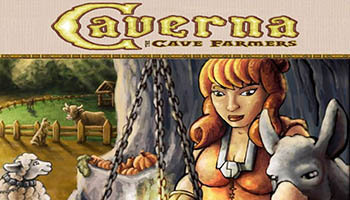 Caverna: The Cave Farmers, which has a playing time of roughly 30 minutes per player, is a complete redesign of Agricola that substitutes the card decks from the former game with a set of buildings while adding the ability to purchase weapons and send your farmers on quests to gain further resources. Designer Uwe Rosenberg says that the game includes parts of Agricola, but also has new ideas, especially the cave part of your game board, where you can build mines and search for rubies. The game also includes two new animals: dogs and donkeys. In this game, you take the roles of adventurous dwarfs living reclusively in caves where you dig for ore and rubies and furnish caverns to become living and working areas. You need ore to craft weapons to undertake expeditions in search of adventure and loot. Rubies are a valuable and highly flexible good: you can trade them for other goods and landscape tiles at any time. At the end of the game, you will lose 1 point for each unused space on your Home board. An unused space is one that does not have a tile (or Stable) placed on it. You will now learn how to get tiles - for your Mountain and for your Forest. Every Expedition yields some loot items as depicted on the "Expedition loot" Overview card. There are a number of Action spaces on which you can undertake an Expedition with an armed Dwarf. Expeditions have one of four different levels (1-4). The Expedition level determines how many different loot items you may choose from the Overview card. (Choose the loot items one by one in any order). In the Work phase, place one Dwarf after another. There are no opponents that you have to wait for. The goal of the solo game is to get the highest score you can. Try to beat the "magical score" of 100 points. You start the game with 2 Food.